Sir Rowland Hill created the image of the first stamp which one penny worth. As this postage stamp was issued in black, later in history, it became famous all over the world as the Penny Black - first postage stamp ever made. It was verified for usafe on 6st of May 1840, and two days later it was issued for common use. The first postage stamp in history, the Penny Black, became available to the public on May 8, 1840. It had a picture of Queen Victoria on it. Later the Penny Black two was released as well, with a seconf image of Queen Victoria. It is interesting that first stamps didn’t have perforations, as people didn’t figure it out back then, so they just cut it out with scissors or knives. By the time Penny Black was released, there had been no use in indicating the country on a stamp, as UK was the one and only country that introduced stamps. Still to that day, UK doesn’t use the name of the country on their stamps, but they have another way of distinction: there always be an image of a reigning person no matter what theme of the stamp is. As soon as stamps were introduced to UK residents, the postal system experienced a small revolution, as the system was simple and increased the speed of the work. Till the introduction of stamps there were 76 million of stamps send in 1839, which is really hard to compare to 1950 and 350 million and it increased a lot beck then. The popularity of letters lasted till the end of 1990’s, as the Internet messaging took its niche. 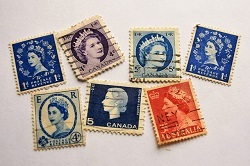 The presence of stamps has led to the growth of stamp collectors and the postage stamps of each country in the world became a subject for enriching the collection. Soon after the familiarizing with adhesive stamps in 1840, people started collecting these items. They couldn’t even imagine that their actions can lead to one of the most widespread hobby in the world. What’s more they couldn’t even imagine that people can get extremely rich because of few rare stamps gathered together. Philately is the study about stamps, its history, and everyhting connected to postage stamps. Stamp collecting does not mandatory involve the study of stamps. Basically, you might be called a philatelist even though, you didn’t obrain any stamps. Philatelists often just use the scientifical approach and learn stamps that are important to history and are kept in museum, but basically philatelists do not have these stamps for themselves.